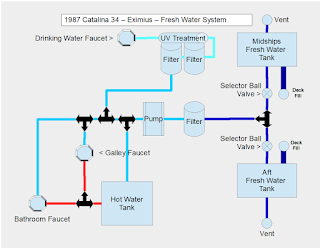 The fresh water plumbing on Eximius is old. If it were copper pipe, that would not be an issue, but it's plastic hose, aged, can't see through it even though it's supposed to be transparent, and the Filter is from the dark ages. Time to re-plumb the Water works. We installed a new Galley Sink Faucet, but in the process had to change out the fittings where the faucet attached to the Hot & Cold water hoses. It seemed that every connection that I touched started to leak! And that water strainer! Yuk! 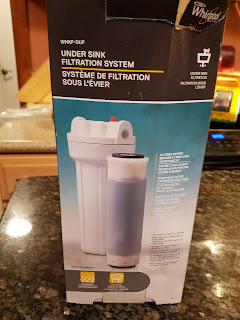 Looking for a replacement water filter online it cost $47.99 and I could buy a pretty decent water filter for the same price. I decided to go with this product. It's an Under sink filter but is actually $10 less than the strainer, I guess it's because it does not have the word 'Marine' or 'Boat' in the product title. 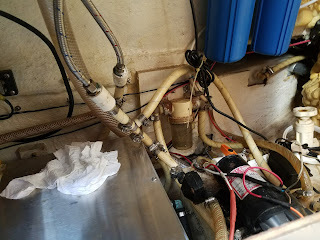 The guys at Lowes were really helpful and we figured out what fittings to use to convert the filter to the 1/2" hose barbs that will connect to the boat plumbing. While in there, I also replaced those awful water tank selector valves with Ball Valves. 1st Step was to cut out all of the hoses from the existing system, leaving just the Tank Supply lines from the Midships and Aft Water tanks. Next, time to install the filter housing. It fits just behind the outboard edge of the Hot Water Tank on the bulkhead between the galley and the salon dinning seating. Here you can see the Drinking Water Filtration system covered in an earlier blog post. I know, it looks grotty down there. 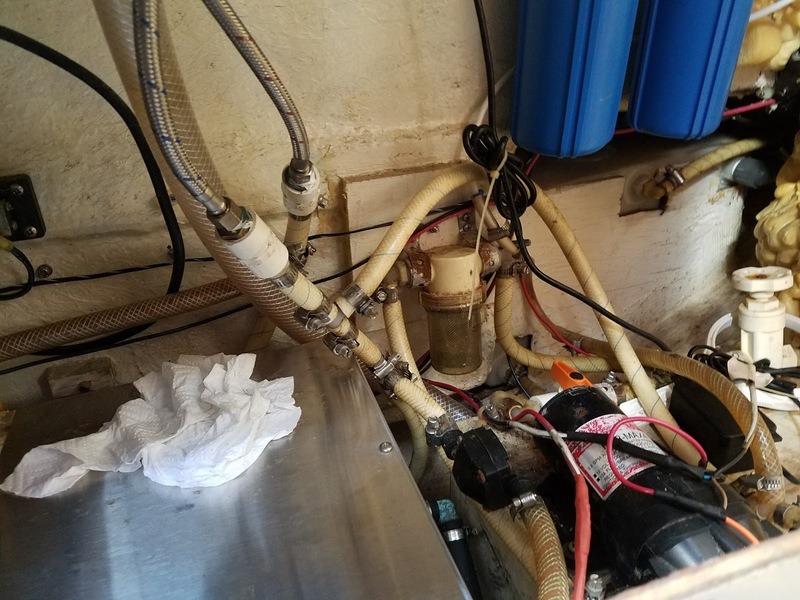 The hose that goes off to the right connects the Midships Fresh Water Tank to the Vent Stanchion on the Starboard side deck. The ply board on the lower right is dirty, it cleaned up a bit, not much, really needs a paint job - one day when I have a can of white paint open! 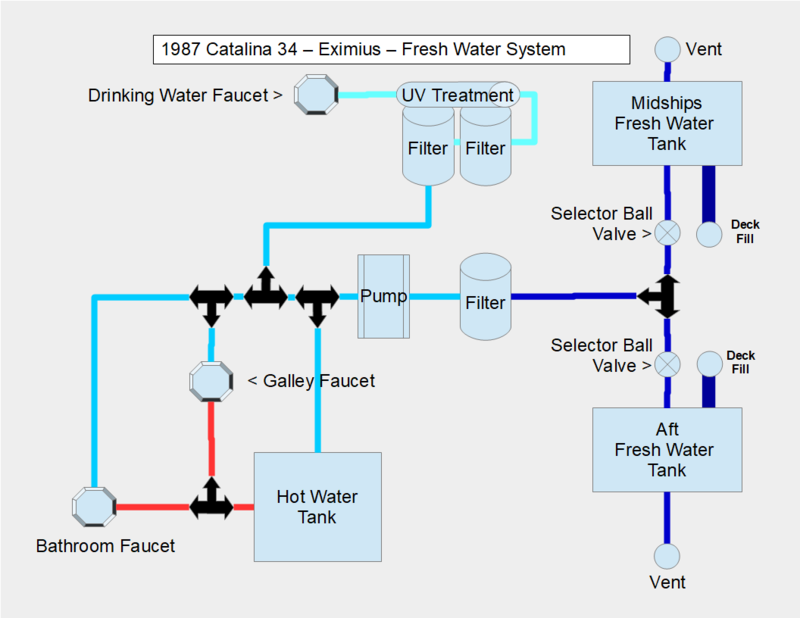 Here's a schematic of the Fresh Water System. The physical installation is pretty much similar. 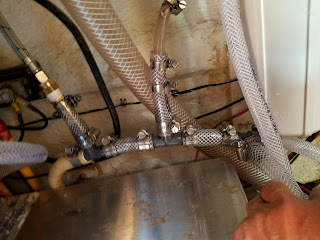 There's a 3 port Cold water manifold made from 3 Nylon T connectors and hose clamps. The Selector Ball Valves are connected to a Nylon T Connector. 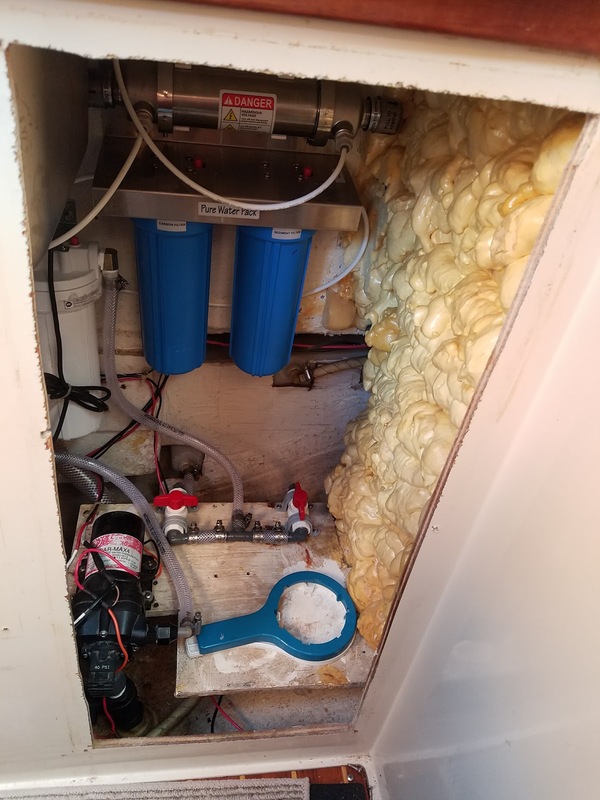 The New Filter is connected before the Pump so that all of the Fresh Water supply to all of the faucets is filtered. The new ball valves make turning the water supply on and off a breeze, much easier than the old mis-matched valves. The Blue and White ring wrenches are for the two filter types. Spare filters are kept in the under seat locker in the Aft Berth. 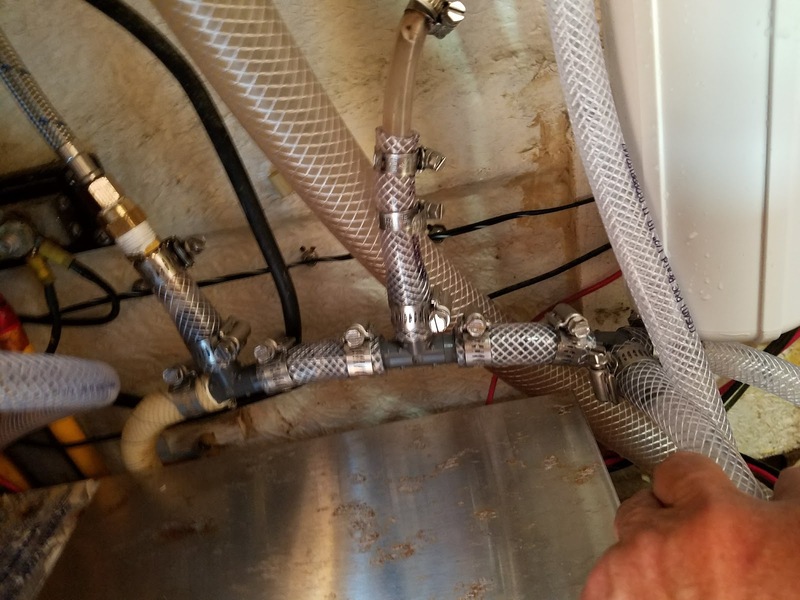 The Cold water supply manifold is simply Barbed Hose T Connectors with a really short piece of hose between each. 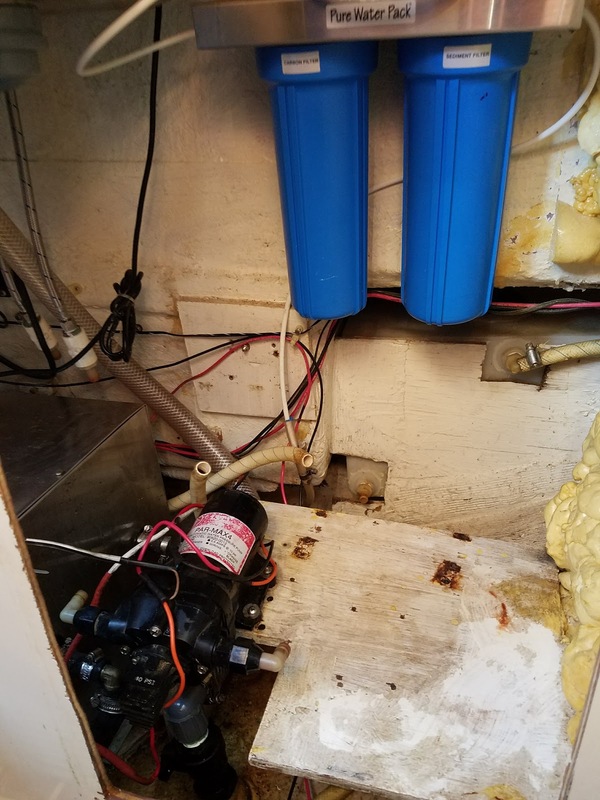 The white hose on the lower right is the cold water supply for the bathroom. It took about 2 hours to re-plumb the fresh water system. I did not replace the hoses to the bathroom or from Midships and Aft fresh water tanks. 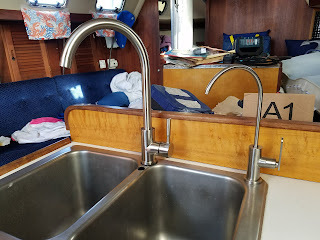 We replaced both the Drinking Water faucet and the Galley Sink Water Faucet - they were only about $30 each from Amazon. Very pleased with the result of this plumbing re-work, the flow has increased at all of the faucets, including the Sink Faucet in the bathroom. So having more, easy control of the galley sink water flow will help save water. And they look really good!